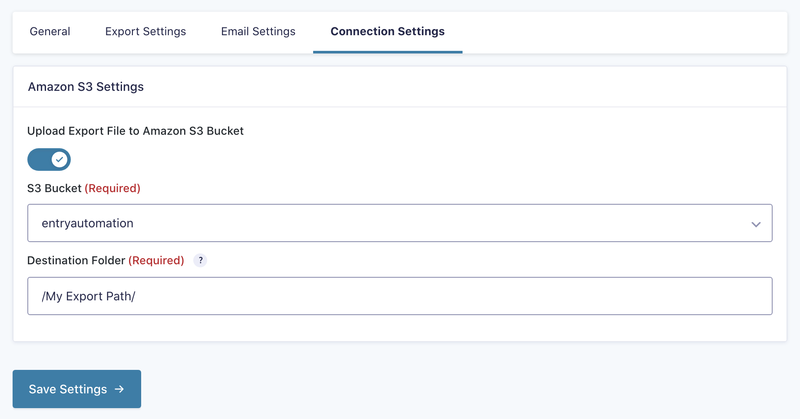 Using the Amazon S3 Extension for Entry Automation, your entries can be sent to your Amazon S3 buckets after the export file has been generated. Amazon S3 Extension can be installed from the Entry Automation plugin settings page, found in the Gravity Forms Settings section. After you’ve entered in your license key, a list of available extensions will be listed. If your license does not have access to the Amazon S3 Extension, an “Upgrade License” button will be available to get access to the extension. Click the “Install Extension” button next to the Amazon S3 Extension to download it to your WordPress site. Then, click the “Activate Extension” button to activate the extension. After activating Amazon S3 Extension, refresh the Entry Automation plugin settings page. There will be a new “Amazon S3 Settings” section with AWS Access Key ID and Secret Access Key fields. Enter in your AWS credentials and click the “Update Settings” button. When Amazon S3 Extension is activated and you have authenticated with Amazon S3, a new Amazon S3 Settings tab is added to the Entry Automation task settings screen when setting up an Export Entries task. The Amazon S3 Settings tab contains fields to select the bucket to upload the export file to and the destination path of the export file. No validation is provided for the destination path as folders are virtual in Amazon S3.